The area's public schools are administered by the Tift County School District. Abraham Baldwin Agricultural College has its main campus in Tifton. Southern Regional Technical College and the University of Georgia also have Tifton campuses. Sites in the area include the Coastal Plain Research Arboretum, Abraham Baldwin Agricultural College, and the Georgia Museum of Agriculture & Historic Village. The Tifton Residential Historic District is listed on the National Register of Historic Places. 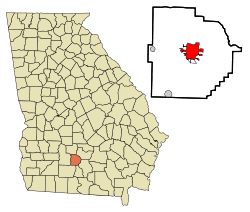 Tifton is located in south central Georgia along Interstate 75, which runs north to south through the city, leading north 167 mi (269 km) to Atlanta and south 45 mi (72 km) to Valdosta. Other highways that pass through the city include U.S. Route 41, U.S. Route 82, U.S. Route 319, and Georgia State Route 125. Henry Tift Myers Airport (IATA: TMA, ICAO: KTMA, FAA LID: TMA) is a public airport located two miles (3 km) southeast of Tifton, serving the general aviation community, with no scheduled commercial airline service. As of the 2010 United States Census, there were 16,350 people residing in the city. The racial makeup of the city was 49.4% White, 36.0% Black, 0.1% Native American, 1.9% Asian, 0.0% Pacific Islander, 0.1% from some other race and 1.1% from two or more races. 11.4% were Hispanic or Latino of any race. As of the census of 2000, there were 15,060 people, 5,532 households, and 3,601 families residing in the city. The population density was 1,686.2 people per square mile (651.1/km²). There were 6,102 housing units at an average density of 683.2 per square mile (263.8/km²). The racial makeup of the city was 61.26% White, 31.57% African American, 0.23% Native American, 1.64% Asian, 0.03% Pacific Islander, 4.61% from other races, and 0.65% from two or more races. Hispanic or Latino of any race were 7.56% of the population. There were 5,532 households out of which 33.5% had children under the age of 18 living with them, 40.9% were married couples living together, 20.0% had a female householder with no husband present, and 34.9% were non-families. 29.5% of all households were made up of individuals and 11.2% had someone living alone who was 65 years of age or older. The average household size was 2.50 and the average family size was 3.08. The median income for a household in the city was $30,234, and the median income for a family was $37,023. Males had a median income of $27,206 versus $20,174 for females. The per capita income for the city was $16,455. About 20.7% of families and 26.9% of the population were below the poverty line, including 41.0% of those under age 18 and 13.7% of those age 65 or over. Child workers at Tifton Cotton Mills, 1909. Photographed by Lewis Hine. Tifton was founded in 1872 at an important railroad junction in Berrien County. The community was named for local sawmill owner Henry H. Tift. Tifton was incorporated as a city in 1890. In 1905, it was designated county seat of the newly formed Tift County. The routing of major Chicago-Florida passenger trains with stops in Tifton reflected this importance as a railroad town: the Atlantic Coast Line's Seminole, Flamingo and City of Miami and the Southern Railway's Ponce de Leon and Royal Palm. With the end of the Royal Palm in 1970, passenger trains were gone. Progress met the south when President Eisenhower called for a modern road system that would allow travelers to get from place to place safely and in record time: the interstate highways. The interstate was a major contributor to the demise of many downtowns. New areas of development came alongside these roadways as they were built. Since World War II, many women had joined the workforce and did not have the time or luxury of staying home with children while father was at work. Quietly, the community's focus on town activities shifted from the town center to the new suburbs. Hotels were being built along the interstate to accommodate the travelers. Service stations and shopping areas were going where the development was occurring, on the interstate. The location along a major junction of highways made Tifton the ideal location for medical services serving a large (HSA 4140) geographic area. The Tifton Gazette is a thrice-weekly newspaper published in Tifton, Georgia. It is operated by South Georgia Media Group, a division of Community Newspaper Holdings Inc. The Tifton Grapevine  is a twice-weekly online newspaper with an email circulation of 4,800. It is operated by Sayles Unlimited Marketing. In 2010, the indoor football team Georgia Firebirds relocated from Waycross, Georgia to Tifton. The Tift County School District holds pre-school to grade twelve, and consists of a pre-K center, four primary schools, four elementary schools, one middle schools, one ninth grade campus, one high school, and an alternative school. The district has 467 full-time teachers and over 7,641 students. Tifton has a public library, in addition to an extensive college library located at nearby Abraham Baldwin Agricultural College. Until recently, Tifton was the home of the world's second largest magnolia tree, which was located in Magnolia Tree Park. In 2004, the tree was burned in a fire. The cause of the fire has never been given by local authorities. Currently, the tree and observation area are blocked from visitors by a gate. Although it no longer grows, the tree still stands. It is not known where the new second largest magnolia tree resides. The Georgia Museum of Agriculture & Historic Village, formerly known as Agrirama, is located in Tifton, Georgia. It opened on July 4, 1976. The grounds consist of five areas: a traditional farm community of the 1870s, an 1890s progressive farmstead, an industrial sites complex, rural town, and national peanut complex; and the Museum of Agriculture Center. Over 35 structures have been relocated to the 95-acre (380,000 m2) site and faithfully restored or preserved. Costumed interpreters explain and demonstrate the lifestyle and activities of this time in Georgia's history. The Tifton Residential Historic District was listed on the National Register of Historic Places on April 30, 2008. It is bounded generally by 14th Street, Goff Street, 2nd Street and Forrest Avenue at coordinates 31°27′35″N 83°30′25″W﻿ / ﻿31.45972°N 83.50694°W﻿ / 31.45972; -83.50694﻿ (Tifton Residential Historic District). The Tifton Commercial Historic District and the Tift County Courthouse are also on the National Register. ^ latasha.ford@gaflnews.com, Latasha Ford. "Council appoints interim city manager". ^ Hellmann, Paul T. (May 13, 2013). Historical Gazetteer of the United States. Routledge. p. 250. Retrieved 30 November 2013. ^ Weingroff, Richard F. (Summer 1996). "Federal-Aid Highway Act of 1956: Creating the Interstate System". Public Roads. 60 (1). ^ "Tifton Grapevine - Home". Tifton Grapevine. ^ Georgia Board of Education[permanent dead link], Retrieved June 28, 2010. ^ School Stats, Retrieved June 28, 2010. ^ Abraham Baldwin Agricultural College, Retrieved June 28, 2010. ^ Southern Regional Technical College- Tifton Campus Archived 2010-05-29 at the Wayback Machine, Retrieved June 28, 2010. ^ University of Georgia- Tifton Agricultural Campus, Retrieved June 28, 2010. ^ "Homepage". Tifton - Tift County Public Library. Archived from the original on 21 July 2014. Retrieved 30 July 2014. ^ "Landmark still recuperating from fire". The Tifton Gazette. 2006. Archived from the original on 2012-09-14. Retrieved 2008-02-13. ^ "Florida State all-time team". 2001-01-31. Retrieved 2008-02-24. ^ Tifton becomes sister city to Linyi, China » Local News Archived 2012-07-16 at Archive.today. Tifton Gazette. Retrieved on 2013-08-09. Wikimedia Commons has media related to Tifton, Georgia. This page was last edited on 8 February 2019, at 22:15 (UTC).